The video of the NPT vs IVF debate is now available on the web site listed below in the original post. Thomas Hilgers, MD will be debating one of Poland’s leading IVF physicians on Friday, September 23rd (9:00 am CEST/ 2:00 am CST) following his Thursday, September 22nd (11:00 am CEST/ 4:00 am CST) lectures on NaProTechnology at the Polish Society of Perinatal Medicine meeting in Poznan, Poland. Both meetings will be broadcast live on the Internet. Tune in to hear the live webcasts of Dr. Hilgers as he presents the culture of life and the benefits of NaProTechnology at a conference for perinatologists in Poland. This is an exciting opportunity for the physicians of Poland and for people around the world to hear about the medical, surgical, and ethical superiority of NaProTechnology to in-vitro fertilization. 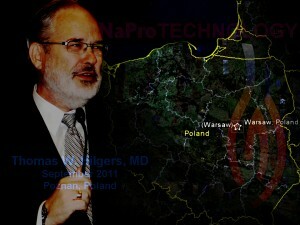 Thanks for your prayers as Dr. Hilgers speaks out for LIFE!!! One of our popular newsletters, FertilityCare for Young Women has a new look! This newsletter, started in 2009 by the Institute’s FertilityCare Center of Omaha, is specifically designed for college-aged and post-college-aged women. Many of the topics address issues that affect young women, their health, and their fertility. The pages are also filled with interesting biological facts in the Did You Know??? and the Fun Facts about Your Fertility sections. The articles serve to support young women in their commitment to chastity and true expressions of love. Also, women will find features on virtuous men and women who can serve as models of Christian virtue in contemporary life. Be sure to read our latest issue and share this publication with the young women whom you know! Listen to Catholic Answers Live this Friday, September 9th starting at 5:00 p.m. CST to hear an interview with Dr. Hilgers, Fertility as Gift! To hear Dr. Hilgers’ interview this Friday on Catholic Answers Live, visit Catholic Answers Live and click on the Listen Live link immediately above the top left corner of the calendar. Or, on the sidebar, select “Live 3pm-5pm, EWTN” under Catholic Answers Live heading. By selecting the program “Fertility as Gift – Dr. Thomas Hilgers” on the September 9th calendar block , you will find options to set an online reminder for yourself and to share this news with friends too!